Clusters are geographic concentrations of interconnected industries and supportive organizations that make regions uniquely competitive for jobs and private investment – like the automotive cluster in the South and the biotech cluster in the Northeast. Clusters are not top-down formulas aimed at being a panacea for all economic development needs. Nor are they intended to serve as a litmus test for qualifying or strictly characterizing good or bad projects. 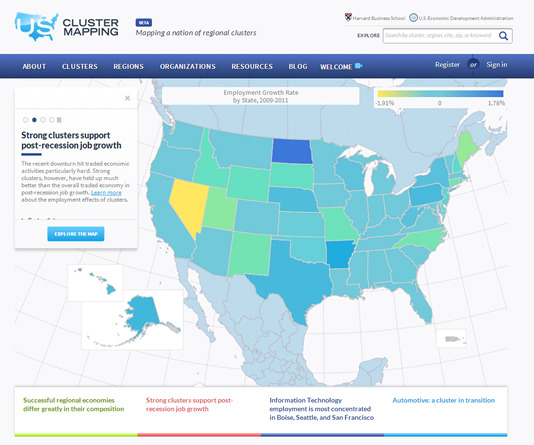 Clusters thrive and are critical in both urban and rural communities and provide a framework for understanding regional competitiveness and drivers of private investment and job creation. They also help identify and prioritize opportunities for public investment and provide a platform for linking, leveraging, and aligning federal or state programs to get a better return on investment of taxpayer funds.